What you think you know and understand about integration is about to be tossed out the window. A new breed of technology providers will try to match the capabilities of newer platforms with newer integration strategies, approaches, and technologies. The good news? These more modern approaches and technologies will have the best chances of meeting your future integration needs. 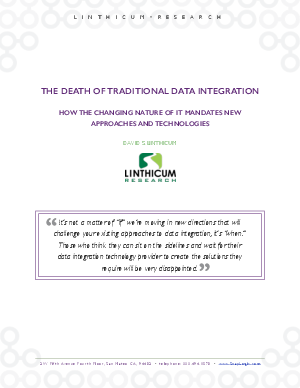 Indeed, they will have to meet your needs, because traditional data integration technology will soon be a thing of the past, given the changing nature of information technology.